We want to be Inspire Everyday, we can do it from the moment we wake up. The best way to start attracting good positive energy is by being grateful that we're still alive and the rest will follow. My daily routine changed over the last three months. I woke up early and prepare for work. Traveling from house to the office was really exhausting. Not to mention the traffic and difficulty getting cab. But I tried to react in the situation by smiling, saying hello and thank you to the people I would passed by especially the lady who operates the elevator and the security personnel I meet at the gate. These I believe spread good vibes and uplift the spirit of others. I met people complaining about life - work, family, traffic, high cost of living, wages and a long list goes on. I used to be like them until I changed. I'm so grateful for people around me, reminding that life is truly wonderful. Life is a celebration! Last weekend, I went to Ayala Museum to join the "Inspire Every Day" celebration. Avida Land, in collaboration with the Ayala Museum and CNN Philippines Life, present a full-day event at the Ayala Museum that celebrates art, literature, history and everything in between, aiming to inspire visitors to pursue their passions in their daily lives. I posted on Twitter how surprised I was when I saw a huge crowd at the museum. Visitor participated in activities and pocket events. Thanks for the free admission at the museum we had free access to enter Ayala Museum and the Filipinas Heritage Library. We were also treated to a selection of changing exhibitions, such as Object Travelogue/Dialogue, which showcases pieces from the Ayala Museum collection that have been featured in exhibitions abroad; Sanso: Setting the Stage, an exhibition of reproductions of Sanso’s work by artists Toym Imao and James Reyes that showcase his stage and costume design work; and The Diary of Tetsuya Noda: Steven Co Collection, which presents an intimate glimpse into the life of the Japanese contemporary printmaker. There's an exhibit from Julia Nebrija called Old Manila Lego Architecture. The day is action-packed, with talks on How to Make it in Manila from Manila’s most in-demand fashion photographer BJ Pascual which I missed. But I was able to hear the talk of multi-award winning film director, composer, editor, sound designer and writer Jerrold Tarog. Just outside the museum was Avida Land’s Homepossible installation, located at the Museum Café and brought to life by painter and calligrapher Anina Rubio’s live art. 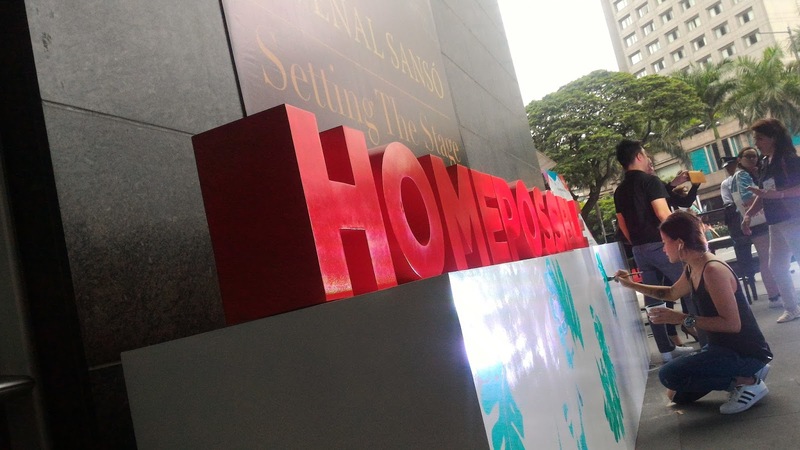 Through Avida’s Homepossible event, visitors are given an opportunity to become home buyers, find a space where they can express themselves and experience an inspired life firsthand. Avida also launches “Pursuit of Passion,” a lifestyle blog and resource guide that motivates and encourages everyone to breathe life into their passions for art, design, wellness and finance. “Inspire Every Day and Homepossible are venues for the public to be inspired to achieve their dreams and live their aspirations. We hope that visitors can take their learning from the day and carry them on into their daily lives,” says Tess Tatco, Avida Marketing Head. Avida believes that a place to dream and thrive is vital to being able to create opportunities and pursue passions. For more information, visit pursuitofpassion.ph and www.avidaland.com. How do you make everyday inspiring?